Welcome to the Ultimate LinkedIn Guide! This article is the first part of a three-part series that will guide you through LinkedIn. In today’s article, we’ll look at how to optimize every section of your profile. Next week, we’ll discuss connecting with LinkedIn members. In the third and final part, we’ll examine ways to engage with your network connections. Consider this article a checklist that can help you stay on track when crafting a great LinkedIn profile. This article contains all the same checklist items I use when guiding my own clients through the process. This is more important than many people realize. If you don’t create your profile with a clear brand or message in mind, you’ll have an unfocused profile. Consider the following sections components of your branding strategy. Although keywords are not enough to raise your profile to the top of a recruiter’s search results, they are still important. Keep in mind that some areas of your profile are weighed more heavily than others when it comes to keywords — specifically, your headline and job titles. As we go through each section below, check off the ones you feel are strong. If you can’t check off some of the sections, read about how to make them stronger. Your background image is your first chance to brand yourself on your profile. It is important to use a photo that is relevant to your work or what you enjoy doing. Your image should be sized at 1,584 by 396 pixels for the best results. If you think a photo is unnecessary, you are sadly mistaken. A profile sans photo gives the impression you can’t be trusted. In addition, people won’t recognize and remember you. LinkedIn says profiles with photos are 21 times more likely to be viewed than those without. Your photo is a huge part of your brand. You don’t have to necessarily dress to the nines for it. Just look professional and presentable. Perhaps the most critical component of your branding, your headline tells readers your title and areas of expertise. Don’t scrimp on this one — it carries a lot of weight when optimizing your profile. You have 120 characters to use — make them count. Fairly new on the scene, this is a welcome change. (See boxed section of photo below.) When they click on the information in this box, readers are brought to your place of employment, education, contact info, and/or your connections. Much has been written about LinkedIn summaries, so I’m going to spare you the verbiage and simply say your summary must tell your story. It needs to articulate your passion for what you do, how well you do it, and a call to action (how you can be reached). You have 2,000 characters, so I would use them all. 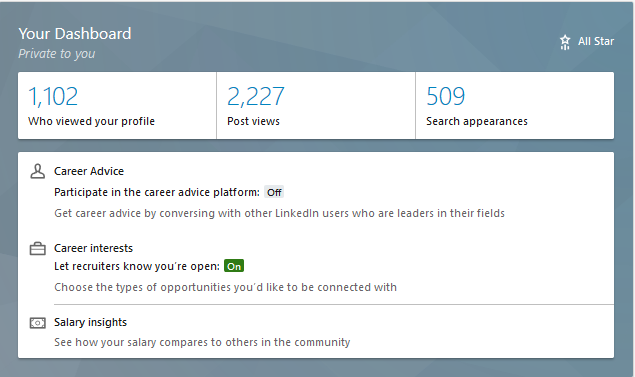 The dashboard area contains a lot of handy information: views of your profile, views of your latest post, and the number of searches you’ve appeared in. In addition, you can ask for career advice, turn on “career interests,” and check out the salary range for your position. Too often, people skimp on the details in their experience section. This is particularly the case with C-level job seekers. You don’t need to include everything, but your major accomplishments are required. Note: Your job titles carry significant weight in terms of keywords. Don’t be afraid to add a little more character here than you would on your resume. Were you a D1 athlete? Mention that under “Activities and Societies.” Did you complete your degree while working full-time? Mention that in the “Description” area. Don’t neglect this area. Employers appreciate people who give to their communities. This is also a section where you can showcase your personality. Your volunteerism doesn’t have to be job-related. If it is, list it in your experience section. 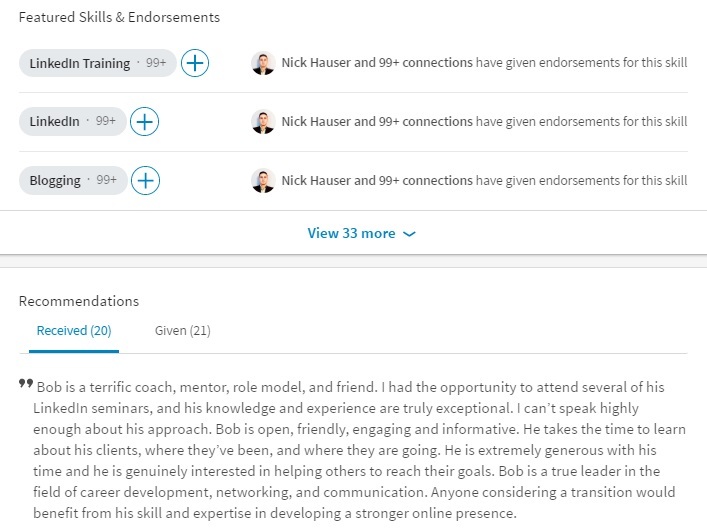 You can list a total of 50 skills, and others can endorse you for those skills. Take advantage of this section, as recruiters pay attention to the number and types of skills you have. When you apply for a job through LinkedIn’s “Easy Apply” feature, the number of skills you have for the job are counted. Once considered one of the top features, recommendations have been relegated to the basement of your profile. Should you continue to ask for and write recommendations in light of this change? In my opinion, yes. Recruiters will continue to read them. One of the major blunders LinkedIn has committed is anchoring this section in the basement of the profile. I say this because important information lies within, including lists of projects, organizations, publications, and patents. This section shows visitors your interests in influencers, companies, groups, and schools. Recruiters might glean some information about you, based on the groups you’ve joined and the companies and schools you follow. Rich media areas reside in your summary (shown below), experience, and education sections. Here, you can post videos, audio files, documents, and PowerPoint presentations. See this as your online portfolio. 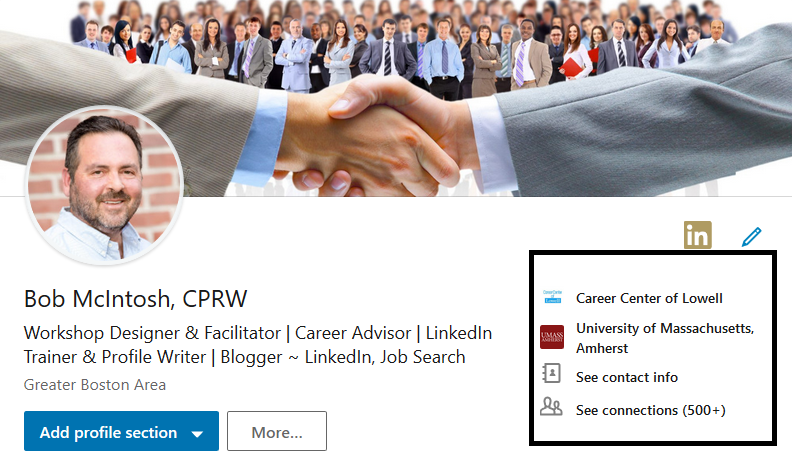 LinkedIn gives you the opportunity to blog on topics of interest and share the posts with your connections. If you’re consistent in blogging, you’ll develop a following. Promoting your blog is entirely up to you. In the past, whenever you published, your connections would receive notification of your posts. Not so anymore. Video is becoming more important to standing out on social media. A good video must contain content that is relevant to your network. Small technical things like smiling, proper lighting and sound, and a steady camera are important. This video from Steph Cartwright is a good example of what your videos should look like, if you choose to make any. If you are diligent about completing the sections of your profile covered here, you will be a third of the way toward a great LinkedIn campaign. 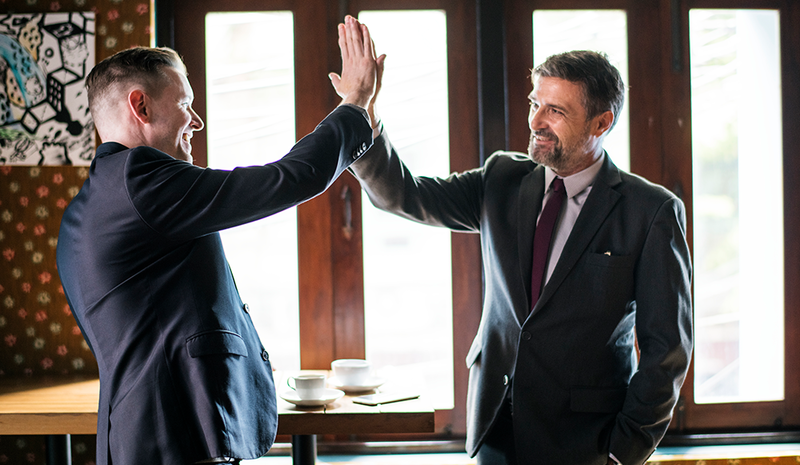 Now check out part two of the Ultimate LinkedIn Guide to learn about connecting with people to expand your professional network.